AMORIELLO Release Lyric Video For Debut Single, "Battle Song (feat. Vinny Appice)"
Neo-Classical Hard Rock Project AMORIELLO--launched by renown guitarist, educator, and author Tom Amoriello and featuring former members of Black Sabbath, Dio, Yngwie Malmsteen’s Rising Force, Ozzy Osbourne, Whitesnake, Quiet Riot, TNT, Loudness, Dokken, Impellitteri, and Cacophony--has released a lyric video for "Battle Song (feat. Vinny Appice)", the debut single off of their upcoming self-titled LP. A tribute to metal legand Ronnie James Dio, "Battle Song (feat. Vinny Appice)" includes a thunderous drum solo for 16 bars by the former SABBATH/DIO drummer with an emotional vocal delivery from Nick Z Marino from the current Malmsteen lineup. IMPELLITTERI bassist James Amelio Pulli and ex-Yngwie keysman Michael Troy also contribute their substantial talents to the track. 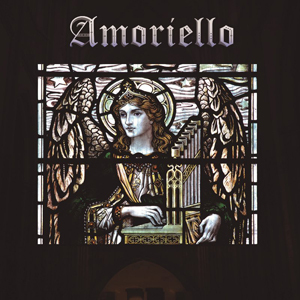 "The entire AMORIELLO album is emotional, and Battle Song (feat. Vinny Appice)" is one that takes on the unending conflict between two sides: aggression versus calm, combativeness versus compromise. The music is taut and stormy, then somber and solemn. The whole album is a testament to the metal legends who inspired me, written with world class musicianship from those same icons. I dedicated this track to Ronnie James Dio (I attended his last concert in Atlantic City, NJ) and wanted someone who had been a part of his sound, hence Vinny Apice. In the course of of recording, showcasing his unique style, he let loose for 16 bars in that incredible solo, and all of the ambitions were met."